The Western Blot: A General Overview - Advansta Inc.
First published in 1979, the Western blot has become an essential assay for protein researchers. Westerns blots are used to estimate the molecular mass of a protein, examine protein post-translational modifications and quantify the amount of protein within a sample. Western blots rely on antibodies to detect and quantify proteins, therefore the quality of the antibody is crucial to a successful Western blot. While Western blots are difficult to perform in a high-throughput manner, they are extremely useful in proper identification of a protein. Below we discuss some of the important points to consider when developing a Western blot assay. There are five main parts to a Western blot assay. Proteins are first separated by molecular weight via electrophoresis through an acrylamide gel. This separation allows for identification of a target protein based on the size of the protein. Gel electrophoresis can be performed under native or denaturing conditions. Next, the proteins are transferred and bound to a solid membrane support. After transfer, the membrane is blocked to prevent nonspecific binding of proteins during subsequent immunodetection steps. Blocking is important for reducing background and increasing the signal-to-noise ratio. The membrane is then incubated with a specific antibody that recognizes the protein of interest and provides a means of detection. After washing the membrane to remove unbound antibodies, the label on the antibody is used to visualize the protein of interest. Antibodies can be tagged with enzymes that produce color and light, or directly labeled with fluorescent tags for visualization of the protein. The first step in a Western blot is to load protein samples onto a gel matrix. Electricity is applied to the gel and the negatively charged proteins migrate toward the positively charged electrode. Proteins migrate to a position determined by the mass: charge ratio and/or three-dimensional structure of the protein. This migration allows proteins to separate based on size and helps allow identification of proteins due to their molecular weight. Gel electrophoresis can be performed under two conditions, denaturing or native, depending on the type of assay being performed. The most common type of gel used for Western blots is a denaturing gel (typically called SDS-PAGE; sodium dodecyl sulfate polyacrylamide gel electrophoresis). 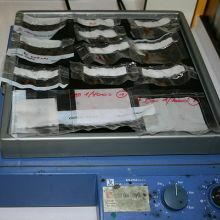 In denaturing gels, protein samples are mixed with detergent and a reducing agent (dithiothreitol or β-mercaptoethanol) and the sample is heated prior to loading. This causes disruption of protein complexes and disassembly of the proteins’ tertiary structures into linear proteins. In addition, the detergent equalizes all the negative charges on the proteins. The end result is linear proteins that migrate based on their molecular weight. Smaller proteins migrate faster through the gel while larger proteins migrate slower. In native gel electrophoresis, samples are harvested in buffers that allow proteins to retain their three dimensional folded states and interactions with other proteins. Therefore, separation on the gel occurs by the protein’s mass: charge ratio and cross-sectional area. Native gels are useful when using antibodies that only recognize an epitope on the folded protein or when studying a protein complex. Thicker gels (e.g. 1.5mm) can accommodate larger sample volumes and are more durable, but they require longer run and transfer times and proteins may become diffuse. Thinner gels (e.g. 0.75mm) are more fragile and difficult to handle and require smaller sample volumes. However, proteins elute more efficiently out of thinner gels and the proteins tend to be more sharply focused in the gel. The resolving power of the gel is determined by the percentage of acrylamide in the final gel solution. Higher percentage gels resolve proteins with smaller molecular weights while larger proteins require a lower percentage gel for good resolution. See the table below for recommended gel percentages based on protein molecular weight. After electrophoresis, proteins must be eluted out of the gel and to a solid membrane support where they are retained for subsequent steps. Similar to the electrophoresis of proteins through the gel, proteins are induced to migrate out of the gel using an electric field (termed electrophoretic transfer). In most transfer systems, negatively charged proteins move out of the gel towards a positively charged electrode. The important factors to consider when setting up a transfer are the membrane type and the type of transfer, either wet or semi-dry. The two most commonly used membrane types for Western blots are nitrocellulose and polyvinylidene difluoride (PVDF). Both nitrocellulose and PVDF instantaneously and nearly irreversibly bind protein. Nitrocellulose was introduced first and remains popular as it often gives lower background for chemiluminescent detection. Nitrocellulose is more cost-effective than PVDF and is easier to use as it does not require an activation step. Nitrocellulose is fragile however, and care must be taken when manipulating the membrane. PVDF membranes are more durable than nitrocellulose membranes and are used when blots are to be stripped and reprobed. PVDF membranes are the membrane of choice for fluorescent detection methods, as low-autofluorescence PVDF membranes have been developed for this purpose. A disadvantage to PVDF is that it must be activated by pre-wetting the membrane in methanol prior to use, adding in an extra step to the experiment. In addition, chicken antibodies can bind to PVDF membranes, therefore nitrocellulose should be used if using antibodies from this species. There are two main types of apparatuses used for transfer: wet transfer (also called tank) and semi-dry transfer. The advantages and disadvantages of each type are discussed in depth in Western Blotting: Transfer, and are summarized here. In a wet transfer, the transfer stack is completely submerged in transfer buffer in a specially designed transfer tank. Electricity is conducted through the large volume of buffer. Wet transfer works well for most routine protein work and provides the most quantitative data. Wet transfer provides the most flexible type of transfer as transfer buffer, voltage and length of transfer can be adjusted to increase transfer efficiency. While heating of the transfer buffer can result in inconsistent transfer, good lab practices and cooling equipment can prevent heat build-up. In semi-dry transfer, the filter paper is pre-soaked in transfer buffer, which provides the buffer required for transfer. The stack is placed directly between plate electrodes. Because the distance between the electrodes is minimal, high electric field strengths are achieved and transfer is rapid (< 1h). While semi-dry transfer requires less buffer, is less time-consuming and works well with some proteins, it can be difficult to optimize conditions for proteins and is not the recommended transfer method when performing quantitative Westerns. Transfer buffers must both induce elution of proteins from the gel and promote binding of the proteins to the membrane. Different transfer buffers can be used to optimize transfer and retention of proteins. In particular, different buffers may be especially helpful when transferring basic proteins or when working with very large or very small proteins. Different types of transfer buffers are discussed in Western Blotting: Transfer. Blocking the membrane is crucial in obtaining a high signal-to-noise ratio and preventing non-specific binding of antibodies to proteins. Optimization of the blocking step enhances the specific signal for the antigen-antibody interaction while decreasing background noise. Inadequate blocking results in excessive background and lowers the signal: noise ratio. Excessive blocking can inhibit antibody: antigen interactions or interfere with detection reagents, lowering detection of the true signal. The blocking buffer is composed of a base salt solution (usually phosphate buffered saline or Tris-buffered saline) that is compatible with antibody incubation and wash solutions and detection methods. Blocking agents specifically optimized for the individual antigen-antibody interactions are added to the base buffer. Common blocking agents are protein-derived, such as nonfat dry milk or bovine serum albumin. However, some blocking proteins interfere with antigen-antibody interactions. In these cases, a protein-free blocking agent, such as AdvanBlock-PF can be used. Often, a mild detergent is also included in the blocking solution to decrease background. Specific blocking agents and detergents are discussed in Western Blotting: Blocking Buffers. It is important to remember not to “over block.” High concentrations of blocking agents can mask some antigens. Whereas many protocols recommend 5% nonfat milk, it is often better to start with 1% milk and increase the concentration if the background is high. This is a particular concern when the target protein is not abundant. The blocking step can also be optimized by adjusting the length of the step and the temperature at which blocking occurs. For many Western blots, one hour of incubation at room temperature is sufficient to lower background. However, some antibodies benefit from an overnight blocking step at 4°C. After blocking, the membrane is incubated with antibodies that specifically recognize the protein of interest and provide a means of detection. Usually antibody incubations are performed for one hour at room temperature. However some primary antibodies require overnight incubation at 4°C. The membrane is then washed several times with washing buffer before proceeding to the final step. When the direct detection method is used, the membrane is incubated with a single primary antibody. This antibody recognizes the target protein and is directly labeled with a tag. Direct detection is less time consuming, but it is less sensitive and can be costly as each primary antibody must be tagged. The indirect detection method uses a primary antibody specific for the target protein and a tagged secondary antibody that recognizes the primary antibody. Indirect detection is more popular than direct detection as it is more sensitive and has greater flexibility. A high quality primary antibody is essential to a good Western blot. High affinity antibodies with strong specificity will allow you to detect less abundant proteins and increase the signal-to-noise ratio. Both monoclonal and polyclonal primary antibodies can be used for Western blots. Monoclonal antibodies recognize a single epitope and therefore may not be as sensitive as polyclonal antibodies, however they often give less background and can be used to detect specific post-translational modifications. They are also useful in multiplexing (see Fluorescent detection). Polyclonal antibodies can give a more robust signal as they bind to multiple epitopes in the protein. However, they can give higher background and have a higher chance of cross reactivity. The different types and forms of secondary antibodies are discussed in detail in Secondary Antibodies. Several different antibody labels are described in Secondary Antibodies. Two of the most popular are enzyme and fluorescent labels. Enzyme labels are incubated with substrates to produce color or light. Different types of substrates are available to increase the sensitivity of the assay or to allow quantitative detection. The two most frequently used enzymes are horseradish peroxidase (HRP) and alkaline phosphatase (AP). In general, HRP is more sensitive than AP, because the enzyme has a faster catalytic rate and produces more product in a shorter time. Both HRP and AP can be used for colorimetric and enhanced chemiluminescence detection methods (ECL; light-producing), however HRP is more commonly used for ECL. Fluorescently labeled antibodies conjugated to fluorophores are easy to use for detection as no additional steps are required for substrate development. Multiple dyes in the infrared and near infrared ranges are available and they are especially useful in multiplex assays (see Fluorescent detection). They also provide the most quantitative data with broad dynamic ranges and little saturation. However, the use of fluorescent labels requires the purchase of equipment with the appropriate excitation and emission capabilities for each fluorophore. Both primary and secondary antibodies should be thoroughly titrated before performing a Western blot. This will determine the optimum concentration of antibody that allows for the highest specific signal with the lowest background. Primary and secondary antibodies can be titrated simultaneously using a checkerboard titration. Color generating (chromogenic), light producing (chemiluminescent) and fluorescence-based are the most common detection methods for Western blots. Chromogenic assays are performed by incubating the blot with a dye solution that is converted into an insoluble colored product by the antibody-conjugated enzyme. The product precipitates onto the membrane creating a band of color wherever the antibody is bound. The amount of precipitate formed is proportional to the protein level in the sample. Chromogenic assays are quick, economical, and do not require special equipment for development and documentation. Color development is also easy to monitor and stop when the desired intensity of color is achieved. However, chromogenic assays are the least sensitive assays and the color can fade over time. Chemiluminescent substrates emit light when reacted with an antibody conjugated to an enzyme. The light is captured and archived on x-ray film, or through digital imaging. Chemiluminescence is extremely popular and is often the most general-purpose detection method used for Western blots. It is highly sensitive, with a detection limit of femtograms of protein depending on the substrate. Results are easily documented and archived. The drawbacks to using chemiluminescence are that it can be difficult to detect multiple proteins simultaneously and the dynamic range and tendency towards saturation make it difficult to use in quantitative measurements. In fluorescent Western blotting, secondary antibodies are directly conjugated to a fluorophore, which is excited by light. The emitted light is detected by a digital imager capable of measuring fluorescence or a CCD camera with filters having the appropriate wavelength. The image is then digitized for data analysis. Fluorescent Westerns are becoming increasingly popular in the lab. Although it is not quite as sensitive as chemiluminescence, fluorescent detection is highly quantitative as the amount of detected dye is directly proportional to the amount of protein on the blot. Fluorescent dyes are also extremely stable (blots can be stored for months with little loss in signal) and have a very broad dynamic range. Fluorescent assays have the distinct advantage of being able to multiplex: detect two proteins simultaneously. This is extraordinarily useful in studying posttranslational modifications. Fluorescent imaging can be cost-prohibitive, though. A digital imager is required to detect, capture and archive the fluorescent signal. Antibody costs can also be higher as more antibody is often required for fluorescent Western blotting than chemiluminescent. In addition, one needs to avoid fluorescent producing dyes (such as bromophenol blue) and use fluorescent-specific reagents (low fluorescence PVDF) when using fluorescent detection. Photo courtesy of Jean-Etienne Minh-Duy Poirrier.